"Why is Christ the only way? How was it possible for him to take upon himself the sins of all mankind? Why was it necessary for his blood to be shed? And how can our soiled and sinful selves be cleansed by his blood? "These are mysteries I do not understand. To me, as to President John Taylor, the miracle of the atonement of Jesus Christ is 'incomprehensible and inexplicable.' 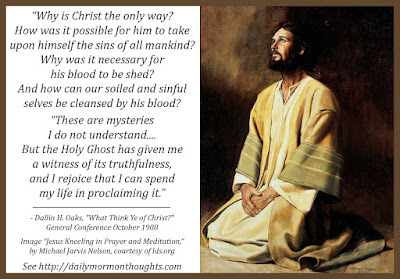 (See The Mediation and Atonement of Our Lord and Savior Jesus Christ, pp. 148–49.) But the Holy Ghost has given me a witness of its truthfulness, and I rejoice that I can spend my life in proclaiming it. 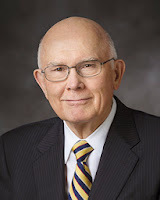 "I testify with the ancient and modern prophets that there is no other name and no other way under heaven by which man can be saved except by Jesus Christ. (See Acts 4:10, 12; 2 Ne. 25:20; Alma 38:9; D&C 18:23.)" I love the frank honesty of this admission: even an apostle, a highly educated man who has spent his life studying, doesn't fully understand the mysteries of how this grand miracle is accomplished; at its essence, the atonement of Jesus Christ truly is "incomprehensible and inexplicable." But that doesn't detract from his testimony of the truthfulness of the concept. A testimony does not require full understanding; it requires recognition of the witness of the Holy Ghost. And President Oaks has that sure witness, which he continues to share through his ministry with all who are willing to listen.